The photo was taken during a trip to Thawang, Rolpa. We were on an 11 days voluntary mission from Kathmandu University. Our objectives were to setup a library, computer lab,distribute medicines and conduct some research. We had stopped for lunch in a local’s house near a place called Uwaa, during the third day of walk. 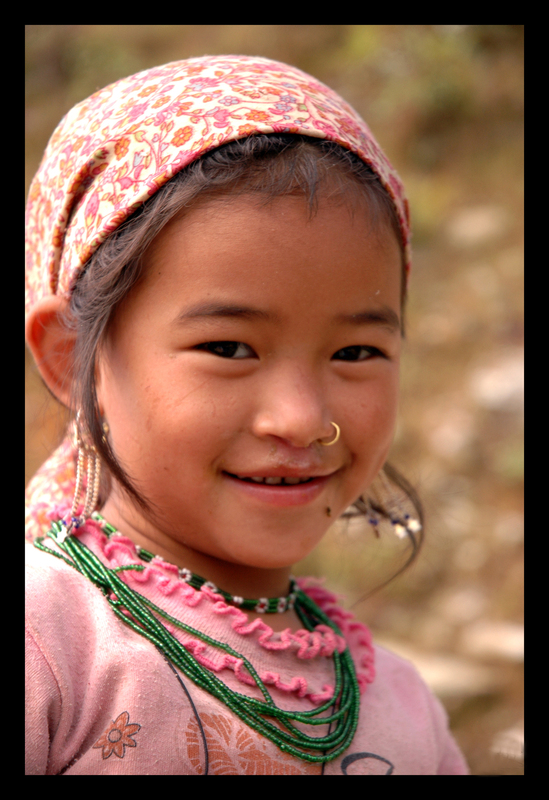 I spotted this beautiful young child climbing up the hill from distance and was fortunate enough to capture this pure and mesmerizing smile of the shy little girl. At a glance, this photo looks like it was taken with preparation and great time in hand. But see it in it’s full size and you’ll see it’s slightly blurred. The minor reason is that the lens didn’t have the VR function. But the major reason is that this photo was a candid shot. Regularly changing the focal length and adjusting the focus (I was using complete manual settings at the time); I had to follow the subject through my viewfinder for a long time, waiting for her to give me a look. The patience paid off; not only did she looked at me but also gave this beautiful smile and I hit the shutter button almost instinctively. Even though it could have been sharper, judging by the circumstances in which it was taken, the patience it required and the essence that this picture is able to capture, it still amongst my favorite shot of all time!